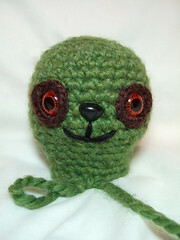 I've been busily crocheting some stuffed animals. When I was a kid I had about forty-two thousand stuffed animals. Among my favorites was a little family of pink piggies my Aunt Nay crocheted for me. Now that I'm all grown up, I can crochet my own stuffed animals. Isn't life grand? 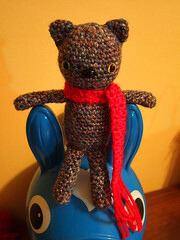 I finished the tweed cat with the spiffy red scarf the other night. I used some Red Heart Tweed I bought ages ago and knit five inches of a mistake rib scarf I then abandoned out of sheer boredom. I really hate knitting scarves. So, I had this skein of dark grey tweed and thought, "This would make a good cat," so I busted that sucker out of retirement and crocheted away. I gave him two different colored eyes, à la David Bowie, just because I thought it looked cool. The scarf is made of red Knitpicks Wool of the Andes. I have many random skeins of that stuff rolling around in my stash. It's good for felting and the colors are absolutely vibrant. 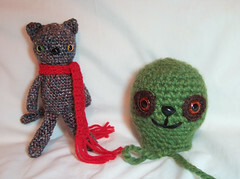 After I finished the little guy I moved on to a new project: a gigantic cat made of Lionbrand Wool-Ease Thick & Quick. I bought three or four skeins of it for a super chunky shrug I attempted when I first learned to crochet. That WIP also ended up in my stash drawer (I should say stash drawers, for I have several). Do you see a pattern here? I buy yarn, start a project, then it gets shelved (sometimes for years) until I figure out something else to make. It's all good as long as I use up the stash, right? Right. This yarn is really thick. It looks like that fat yarn Cindy Brady tied in a bow at the end of her braids. I'm using a K-10.5/6.5mm hook. The head itself is five inches tall. This is going to be one enormous amigurumi. I wish I had a better color than Grass Green, but oh well. I'm thinking of getting a skein of orange or pink to make a shirt or something so he's not naked. They actually sell Lionbrand yarn at the Pratt store, so I could just walk over there tomorrow and get a skein. Oh yay, more yarn for my stash! BTW, I just got the journals! Love them. The Bus Stop one stirs "back to school" memories. I'm glad you like the journals. I'm going to order a few for myself soon!